Dr. William V. Lewis, Jr. is a Commissioner of the Pennsylvania Historical and Museum Commission and serves as a Commission liaison to the Pennsylvania Heritage Foundation. He chairs the state Historical marker selection panel for the Pennsylvania State Historical Preservation Office, under the PHMC. Professionally, he is a Vice President, Wealth Management Advisor and Portfolio Manager with Merrill Lynch Wealth Management in Wilkes-Barre. He is a Certified Financial Planner, a Chartered Financial Consultant, and a Certified Portfolio Manager. Lewis holds a BA and MBA from Wilkes University, an MSFS from The American College for Financial Service, and an MPA and doctorate from Lehigh University. 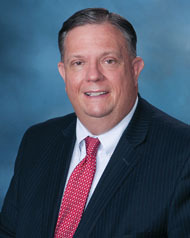 He has served on the adjunct faculty of Wilkes University and King’s College. Lewis is a past president of the Luzerne County Historical Society, past president of the Northeast Chapter, Sons of the American Revolution and an officer of the Wyoming Commemorative Association. He served on the national Board of Governors of the American Red Cross, as a board member of Family Service America and on the National Advisory Council of the Center for the Study of the Presidency. He currently is a board member of the Academy of Certified Portfolio Managers.